Sharing a room, living in a dorm or existing in a space with other people? Here are five reasons you NEED earplugs! Truthfully, there’s no great way to handle this. You could throw a pillow or shake them silly, but that results in awkward tension. The simple and conflict-free solution is to just put earplugs in and sleep peacefully. 2. Your neighbors blast music till 3 a.m. It is the middle of the week, you are trying to study and everything is shaking from the musical vibrations of next door. If you ask your neighbor to turn the music down, maybe they will…or maybe you’ll just piss them off and they’ll turn it up even more. Easiest solution: earplugs. You can’t ask them to chew quieter and the reality is that it won’t take them five years to eat, so just pop in some earplugs until they’re done. You can both do your thing peacefully! If you’ve tried the angry librarian “shhh!” and that’s gotten you nowhere, chances are they aren’t going to stop. It’s not worth losing your concertation—just drown them out! Not everyone can concentrate with music playing, even if it is lyric-less. Know how you work best—if you need silence, swap headphones for earplugs! 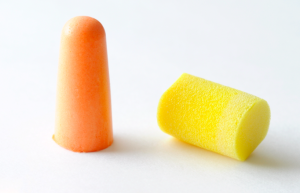 No matter your reason for requiring silence, earplugs are a small (and cheap) way to block out surrounding noise and concentrate!